ROSES RIVALS Yorkshire and Lancashire meet at Emerald Headingley in a crunch County Championship match tomorrow. With both sides languishing towards the foot of the Division One table and with games running out to save their skins, there could hardly be more riding on this latest chapter in county cricket’s biggest rivalry. Lancashire sit sixth in the table and Yorkshire, occupying the second relegation spot, in seventh. One point separates them, with the Red Rose having two to play and the White Rose three. Wicketkeeper Jonny Tattersall is coming to the end of his maiden Championship campaign, but he missed the first fixture at Emirates Old Trafford due to Jonny Bairstow’s availability. A repeat of that July win would do Yorkshire nicely. “My first taste of Roses Championship cricket, and it will be a crucial one at that,” said the 23-year-old from Harrogate. “There will definitely be a bit on it given the situation in the table. We’ve not really spoken about needing this or that number of wins. We’re just trying to focus on the processes. We’ll take it day by day. If we can keep trying to play positive cricket, hopefully we should be alright. “We have that game in hand on them, which we can make use of, but every game is massive from here, and we need to win some games. Yorkshire head into the clash on the back of a high-scoring draw with Nottinghamshire at Trent Bridge, which finished on Friday. Tattersall posted a first-innings 51 as the visitors amassed their highest score of the season – 498 – in reply to the hosts’ 448. It was his second Championship fifty. “It’s pleasing to see we played some better cricket after the last couple of defeats against Worcester and Somerset,” he continued. “We’ve not really spoken about needing this or that number of wins. We’re just trying to focus on the processes. We’ll take it day by day. Yorkshire’s fight at the wrong end of Division One is a far cry from their Championship title successes and challenges of 2014-16, but no one can deny that it is going to prove a fascinating end to the summer. 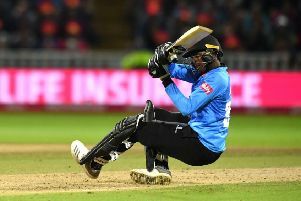 “Sometimes when you play a couple of Championship games in the middle of a season, you can lose the meaning of the points a bit,” said Tattersall, who replaced Andrew Hodd behind the four-day stumps in late June. Yorkshire will welcome back captain Steve Patterson from three games out with a broken finger, while fellow seamer Ben Coad has been added to their squad after missing the same number of games with a side injury. “It will be great to have Patto with us again,” added Tattersall. Lancashire head into this clash on the back of a thrilling tie against Somerset at Taunton, the first in the Championship since 2003. They have only won two of 12 matches this season to Yorkshire’s three from eleven. The visitors could hand a debut to new signing Richard Gleeson from Northants, the England Lions fast bowler.